Whether your hedge is a little overgrown or just needs a trim, Mike's Mowing can help - it's one of our specialties. Routine maintenance is essential for a healthy and aesthetically pleasing hedge. In general, cedar hedges should be trimmed once per year while other faster growing types may require more frequent maintenance. 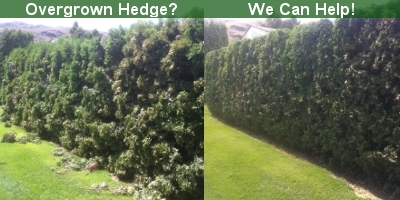 Our hedge trimming service includes topping and/or siding of the hedge, as well as the cleanup and hauling of all debris. Cleaning of the interior of the hedge to prevent debris buildup is also available upon request. In addition to hedges we can also hedge or prune any standalone shrubs, bushes or trees. Whether you prefer a clean manicured appearance, or a more natural look we can keep your shrubs looking great. We also prune fruit trees (apple, cherry, apricot, pear, plum & more). Pruning your fruit trees each spring will help keep them productive, healthy and well shaped.